For the broader concept of direct charges paid by road users, see road pricing. Electronic Road Pricing gantry in Singapore, the first city in the world to implement an urban cordon area congestion pricing scheme. Congestion pricing or congestion charges is a system of surcharging users of public goods that are subject to congestion through excess demand such as higher peak charges for use of bus services, electricity, metros, railways, telephones, and road pricing to reduce traffic congestion; airlines and shipping companies may be charged higher fees for slots at airports and through canals at busy times. Advocates claim, this pricing strategy regulates demand, making it possible to manage congestion without increasing supply. According to the economic theory behind congestion pricing, the objective of this policy is the use of the price mechanism to make users conscious of the costs that they impose upon one another when consuming during the peak demand, and that they should pay for the additional congestion they create, thus encouraging the redistribution of the demand in space or in time, and forcing them to pay for the negative externalities they create, making users more aware of their impact on the environment. The application on urban roads is currently limited to a few cities, including London, Stockholm, Singapore, Milan, and Gothenburg, as well as a few smaller towns, such as Durham, England; Znojmo, Czech Republic; Riga (the scheme ended in 2008), Latvia; and Valletta, Malta. Four general types of systems are in use; a cordon area around a city center, with charges for passing the cordon line; area wide congestion pricing, which charges for being inside an area; a city center toll ring, with toll collection surrounding the city; and corridor or single facility congestion pricing, where access to a lane or a facility is priced. Implementation of congestion pricing has reduced congestion in urban areas, but has also sparked criticism and public discontent. Critics maintain that congestion pricing is not equitable, places an economic burden on neighboring communities, has a negative effect on retail businesses and on economic activity in general, and represents another tax levy. A survey of economic literature on the subject, however, finds that most economists agree that some form of road pricing to reduce congestion is economically viable, although there is disagreement on what form road pricing should take. Economists disagree over how to set tolls, how to cover common costs, what to do with any excess revenues, whether and how "losers" from tolling previously free roads should be compensated, and whether to privatize highways. Also, concerns regarding fossil fuel supply and urban transport high emissions of greenhouse gases in the context of climate change have renewed interest in congestion pricing, as it is considered one of the demand-side mechanisms that may reduce oil consumption. Congestion pricing is a concept from market economics regarding the use of pricing mechanisms to charge the users of public goods for the negative externalities generated by the peak demand in excess of available supply. Its economic rationale is that, at a price of zero, demand exceeds supply, causing a shortage, and that the shortage should be corrected by charging the equilibrium price rather than shifting it down by increasing the supply. Usually this means increasing prices during certain periods of time or at the places where congestion occurs; or introducing a new usage tax or charge when peak demand exceeds available supply in the case of a tax-funded public good provided free at the point of usage. Economic rationale for moving from untolled equilibrium to congestion pricing equilibrium. According to the economic theory behind congestion pricing, the objective of this policy is the use of the price mechanism to make users more aware of the costs that they impose upon one another when consuming during the peak demand, and that they should pay for the additional congestion they create, thus encouraging the redistribution of the demand in space or in time, or shifting it to the consumption of a substitute public good; for example, switching from private transport to public transport. This pricing mechanism has been used in several public utilities and public services for setting higher prices during congested periods, as a means to better manage the demand for the service, and whether to avoid expensive new investments just to satisfy peak demand, or because it is not economically or financially feasible to provide additional capacity to the service. Congestion pricing has been widely used by telephone and electric utilities, metros, railways and autobus services, and has been proposed for charging internet access. It also has been extensively studied and advocated by mainstream transport economists for ports, waterways, airports and road pricing, though actual implementation is rather limited due to the controversial issues subject to debate regarding this policy, particularly for urban roads, such as undesirable distribution effects, the disposition of the revenues raised, and the social and political acceptability of the congestion charge. Congestion pricing is one of a number of alternative demand side (as opposed to supply side) strategies offered by economists to address traffic congestion. Congestion is considered a negative externality by economists. An externality occurs when a transaction causes costs or benefits to a third party, often, although not necessarily, from the use of a public good: for example, if manufacturing or transportation cause air pollution imposing costs on others when making use of public air. Congestion pricing is an efficiency pricing strategy that requires the users to pay more for that public good, thus increasing the welfare gain or net benefit for society. Nobel-laureate William Vickrey is considered by some to be the father of congestion pricing, as he first proposed adding a distance- or time-based fare system for the New York City Subway in 1952. In the road transportation arena these theories were extended by Maurice Allais, Gabriel Roth who was instrumental in the first designs and upon whose World Bank recommendation the first system was put in place in Singapore. Also, it was considered by the Smeed Report, published by the British Ministry of Transport in 1964, but its recommendations were rejected by successive British governments. The transport economics rationale for implementing congestion pricing on roads, described as "one policy response to the problem of congestion", was summarized in testimony to the United States Congress Joint Economic Committee in 2003: "congestion is considered to arise from the mispricing of a good; namely, highway capacity at a specific place and time. The quantity supplied (measured in lane-miles) is less than the quantity demanded at what is essentially a price of zero. If a good or service is provided free of charge, people tend to demand more of it—and use it more wastefully—than they would if they had to pay a price that reflected its cost. Hence, congestion pricing is premised on a basic economic concept: charge a price in order to allocate a scarce resource to its most valuable use, as evidenced by users' willingness to pay for the resource". For the broader concept on roads charges see road pricing. Practical implementations of road congestion pricing are found almost exclusively in urban areas, because traffic congestion is common in and around city centers. Autoroute A1 in Northern France is one of the few cases of congestion pricing implemented outside of urban areas. This is an expressway connecting Paris to Lille, and since 1992 congestion prices have been applied during weekends with the objective of spreading demand on the trip back to Paris on Sunday afternoons and evenings. As congestion pricing has been increasing worldwide, the schemes implemented have been classified into four different types: cordon area around a city center; area wide congestion pricing; city center toll ring; and corridor or single facility congestion pricing. At Old Street, street markings and a sign (inset) with the white-on-red C alert drivers to the congestion charge, London. Cordon area congestion pricing is a fee or tax paid by users to enter a restricted area, usually within a city center, as part of a demand management strategy to relieve traffic congestion within that area. The economic rationale for this pricing scheme is based on the externalities or social costs of road transport, such as air pollution, noise, traffic accidents, environmental and urban deterioration, and the extra costs and delays imposed by traffic congestion upon other drivers when additional users enter a congested road. Rome's Traffic Limited Zone (ZTL) entry control point with automatic surveillance. The first implementation of such a scheme was Singapore Area Licensing Scheme in 1975, together with a comprehensive package of road pricing measures, stringent car ownership rules and improvements in mass transit. Thanks to technological advances in electronic toll collection, electronic detection, and video surveillance technology, collecting congestion fees has become easier. Singapore upgraded its system in 1998, and similar pricing schemes were implemented in Rome in 2001, London in 2003 with extensions in 2007; Stockholm in 2006, as a seven-month trial, and then on a permanent basis. In January 2008 Milan began a one-year trial program called Ecopass, charging low emission standard vehicles and exempting cleaner and alternative fuel vehicles. The Ecopass program was extended until December 31, 2011, and on January 16, 2012 was replaced by Area C, a trial program that converted the scheme from a pollution-charge to a congestion charge. The Gothenburg congestion tax was implemented in January 2013 and it was modeled after the Stockholm scheme. Trängselskatt automatic control point at Ropsten, Stockholm. The sign on the right informs the drivers about the different fees, that vary depending on the time of the day. Although there has not yet been a comprehensive study, initial reports from the cities that have implemented congestion pricing schemes show traffic volume reductions from 10% to 30%, as well as reduced air pollution. Also, all cities report public controversy before and after implementation, making political feasibility a critical issue. Singapore and Stockholm charge a congestion fee every time a user crosses the cordon area, while London charges a daily fee for any vehicle driving in a public road within the congestion charge zone, regardless of how many times the user crosses the cordon. Stockholm has put a cap on the maximum daily tax, while in Singapore the charge is based on a pay-as-you-use principle, and rates are set based on traffic conditions at the pricing points, and reviewed on a quarterly basis. Through this policy, the Land Transport Authority (LTA) reports that the electronic road pricing "has been effective in maintaining an optimal speed range of 45 to 65 km/h for expressways and 20 to 30 km/h for arterial roads". Automatic tolling gantry of Singapore's Electronic Road Pricing scheme. In an effort to improve the pricing mechanism, and, to introduce real-time variable pricing, Singapore's LTA together with IBM, ran a pilot from December 2006 to April 2007, with a traffic estimation and prediction tool (TrEPS), which uses historical traffic data and real-time feeds with flow conditions from several sources, in order to predict the levels of congestion up to an hour in advance. By accurately estimating prevailing and emerging traffic conditions, this technology is expected to allow variable pricing, together with improved overall traffic management, including the provision of information in advance to alert drivers about conditions ahead, and the prices being charged at that moment. In 2010 the Land Transport Authority began exploring the potential of Global Navigation Satellite System as a technological option for a second generation ERP. LTA objective is to evaluate if the latest technologies available in the market today are accurate and effective enough for use as a congestion charging tool, especially taking into consideration the dense urban environment in Singapore. Implementation of such system is not expected in the short term. A proposal by former Mayor of London Ken Livingstone would have resulted in a new pricing structure based on potential CO2 emission rates by October 2008. The goal was that vehicles with the very lowest CO2 emission rates would be exempted, and those with higher emission rates would pay a new higher charge of £25, with the rest paying the same charge they pay today. However, Livingstone's successor as Mayor of London, Boris Johnson, announced at the beginning of his administration that he would reform the congestion charge. Entrance to the London Congestion Charge zone. Shown traffic sign and the CCTV used to control vehicles entering the zone's boundary. Johnson announced in July 2008 that the new CO2 charging structure will no longer be implemented. Among other reasons, he said the environmental charge would encourage travel by thousands of smaller vehicles free of charge, resulting in increased congestion and pollution. He also discarded plans for extending the charge zone to the suburbs, and announced he will review the western extension implemented in 2007, based on a public consultation planned for September 2008. Having held a five-week public consultation with residents in the autumn of 2008, Johnson decided to remove the 2007 Western Extension from the congestion charging zone beginning on January 4, 2011, to increase the basic charge to GB£10, and also to introduce an automated payment system called Congestion Charging Auto Pay (CC Auto Pay), which will charge vehicles based on the number of charging days a vehicle travels within the charging zone each month, and the drivers of these vehicles will pay a reduced GB£9 daily charge. In November 2012 Transport for London (TfL) presented a proposal to abolish the Greener Vehicle Discount that benefited, among others, vehicles with small diesel engines that avoid the charge because their engines produce emissions of less than 100g per km of CO2. Approved by Mayor Boris Johnson in April 2013, the Ultra Low Emission Discount (ULED) went into effect on 1 July 2013. The ULED introduced more stringent emission standards that limit the free access to the congestion charge zone to all-electric cars, some plug-in hybrids, and any car or van that emits 75g/km or less of CO2 and meets the Euro 5 emission standards for air quality. The measure was designed to curb the growing number of diesel vehicles on London's roads. About 20,000 owners of vehicles registered for the Greener Vehicle Discount by June 2013 were granted a three-year sunset period before they have to pay the full congestion charge. The sunset period ended on 24 June 2016. Since the congestion charge introduction in 2003, over £1.2 billion has been invested in transport through December 2013, including £960 million on improvements to the bus network; £102 million on roads and bridges; £70 million on road safety; £51 million on local transport/borough plans; and £36 million on sustainable transport and the environment. There has been criticism because during the first ten years since the scheme was implemented, gross revenue reached about £2.6 billion, but only £1.2 billion has been invested, meaning that 54% of gross revenues have been spent in operating the system and administrative expenses. In June 2014 the standard charge was raised 15% from £10 per day to £11.50. According to TfL the objective of the increase is to recoup inflation over the previous three years and ensure the charge remains an effective deterrent to making unnecessary journeys in central London. A new toxicity charge, known as T-charge was introduced from 23 October 2017. Older and more polluting cars and vans that do not meet Euro 4 standards will have to pay an extra £10 charge on top of the £11.50 congestion charge to drive in central London, within the Congestion Charge Zone (CCZ). The charge typically applies to diesel and petrol vehicles registered before 2006, and the levy is expected to affect up to 10,000 vehicles. London Mayor Sadiq Khan announced the introduction of the scheme in February 2017 after London achieved record air pollution levels the previous month, and the city was put on very high pollution alert for the first time ever, as cold and stationary weather failed to clear toxic pollutants emitted mainly by diesel vehicles. On April 8, 2019, the T-charge was expanded into the Ultra Low Emission Zone (ULEZ). The zone, which currently covers the City and the City of Westminster, will be extended on 25 October 2021 to cover the entire area between the North and South Circular boundary roads. The Ecopass pollution charge ended on December 31, 2011, and was replaced by the Area C scheme, which went into effect on January 16, 2012, initially as an 18-month pilot program. The Area C scheme is a conventional congestion pricing scheme and is based on the same Ecopass geographic area. Vehicles entering the charging zone incur a charge of €5 regardless of their pollution level. However, residents inside the area have 40 free entries per year and then a discounted charge of €2. Electric vehicles, public utility vehicles, police and emergency vehicles, buses and taxis are exempted from the charge. Hybrid electric and bi-fuel natural gas vehicles (CNG and LPG) were exempted until January 1, 2013. Exemption has been postponed until December 31, 2016. The scheme was made permanent in March 2013. All net earnings from Area C are invested to promote sustainable mobility and policies to reduce air pollution, including the redevelopment, protection and development of public transport, "soft mobility" (pedestrians, cycling, Zone 30) and systems to rationalize the distribution of goods. Automatic detection system at Stockholm's first electronic gantry at Lilla Essingen. On 1 January 2016, congestion taxes were increased in the inner-city parts of Stockholm, and also the congestion tax was introduced on Essingeleden motorway. This was the first increase of the tax since it was introduced permanently in 2007. The congestion tax is being introduced at the access and exit ramps of two interchanges on Essingeleden in order to reduce traffic jams in peak periods, and with shorter traffic jams on Essingeleden, the surrounding roads are expected to have shorter tailbacks. The transport agencies involved expected to reduce traffic on Essingeleden by some 10% in peak hours. One week after the tax began to be charged, traffic on the motorway had decreased by 22% compared to a normal day in mid-December. The tax increase was implemented not only to improve accessibility and the environment, but also to help develop the infrastructure. The additional funds will contribute to finance the extension of the Stockholm metro. As the Stockholm congestion tax varies by time of the day, the highest increase took place at the two busiest rush hour periods, 7:30 to 8:29, and 16:00 to 17:29, from SEK 20 to SEK 30. The objective was to steer the traffic towards other times of the day and public transport, and in this way reduce congestion in the Inner City area. Also the maximum amount levied was raised to SEK 105 per day and vehicle. Around Europe several relatively small cities, such as Durham, England; Znojmo, Czech Republic; Riga, Latvia; and Valletta, Malta, have implemented congestion pricing to reduce traffic crowding, parking problems and pollution, particularly during the peak tourism season. Durham introduced charges in October 2002, reducing vehicle traffic by 85% after a year; prior to this 3,000 daily vehicles had shared the streets with 17,000 pedestrians. Valletta has reduced daily vehicles entering the city from 10,000 to 7,900; making 400 readily available parking places in the center. There has been a 60% drop in car stays by non-residents of more than eight hours, but there has been a marked increase of 34% in non-residential cars visiting the city for an hour or less. The New York City congestion pricing proposal was rejected by the New York State Legislature in 2008, but later approved in 2019. Hong Kong conducted a pilot test on an electronic congestion pricing system between 1983 and 1985 with positive results. However, public opposition against this policy stalled its permanent implementation. In 2002 Edinburgh, United Kingdom, initiated an implementation process; a referendum was conducted in 2005, with a majority of 74.4% rejecting the proposal. Councils from across the West Midlands in the United Kingdom, including Birmingham and Coventry, rejected the idea of imposing congestion pricing schemes on the area in 2008, despite promises from central government of transport project funding in exchange for the implementation of a road pricing pilot scheme. In 2007, New York City shelved a proposal for a three-year pilot program for implementation in Manhattan, and a new proposition was denied in 2008, with potential federal grants of US$354 million being reallocated to other American cities. Greater Manchester, United Kingdom, was considering a scheme with two cordons, one covering the main urban core of the Greater Manchester Urban Area and another covering the Manchester city centre. The measure was supported by the government, but three local authorities rejected it (Bury, Trafford and Stockport); the support of two-thirds of Manchester's 10 local councils was needed for it to be implemented. A comprehensive transport investment package for Manchester, which included the congestion pricing element, was released for further public consultation and was to be subject of a referendum in December 2008. On 12 December 2008 the scheme was overwhelmingly rejected by 10 out of 10 councils by a public referendum. Traffic entering San Francisco through the Golden Gate Bridge. In August 2007, the United States Department of Transportation selected five metropolitan areas to initiate congestion pricing demonstration projects under the Urban Partnerships Congestion Initiative, for US$1 billion of federal funding. The five projects under this initiative are; Golden Gate Bridge in San Francisco, State Route 520 serving downtown Seattle and communities to its east, Interstate 95 between Miami and Ft. Lauderdale, Interstate 35W serving downtown Minneapolis, and a variable rate parking meter system in Chicago, which replaced New York City after it left the program in 2008. Governor Andrew Cuomo reintroduced a congestion pricing proposal for New York City in 2017 in response to the New York City Subway's state of emergency, a proposal that Mayor Bill de Blasio opposed. A commission to investigate the feasibility of congestion pricing, organized in late 2017, found that a congestion pricing scheme could benefit New York City. If approved, New York City's congestion pricing zone will be the first in North America. Cuomo's congestion pricing plan was approved in March 2019, though congestion pricing in New York City would not go into effect until 2021 at the earliest. Severe air pollution in Beijing. Motor vehicle emissions account for 31% of the city's smog sources. In September 2011, local officials announced plans to introduce congestion pricing in Beijing. No details were provided regarding the magnitude of the congestion charges or the charge zone. The measure was initially proposed in 2010 and was recommended by the World Bank. A similar scheme was proposed for the city Guangzhou, Guangdong province, in early 2010. The city opened a public discussion on whether to introduce congestion charges. An online survey conducted by two local news outlets found that 84.4% of respondents opposed the charges. In December 2015, the Beijing Municipal Commission of Transport announced plans to introduce congestion charges in 2016. According to city's motor vehicle emission control plan 2013–2017, the congestion charge will be a real-time variable pricing scheme based on actual traffic flows and emissions data, and allow the fee to be charged for different vehicles and varying by time of the day and for different districts. The Dongcheng and Xicheng are among the districts that are most likely to firstly implement congestion charge. Vehicle emissions account for 31% of the city's smog sources, according to Beijing Environmental Protection Bureau. The local government has implemented already several policies to address air quality and congestion, such as a driving restriction scheme based upon the last digits on their license plates. Also a vehicle quota system was introduced in 2011, awarding new car licenses through a lottery, with a ceiling of 6 million units set by the city authority for 2017. In May 2016, the Beijing city legislature announced it will consider to start levying traffic congestion charges by 2020 as part of a package of measures to reform the vehicle quota system. As of June 2016[update], the city's environmental and transport departments are working together on a congestion pricing proposal. Traffic congestion on Marginal Pinheiros, near downtown São Paulo. According to Time magazine, São Paulo has the world's worst traffic jams. Drivers are informed through variable message signs the prevailing queue length. In January 2012, the federal government of Brazil enacted the Urban Mobility Law that authorizes municipalities to implement congestion pricing to reduce traffic flows. The law also seeks to encourage the use of public transportation and reduce air pollution. According to the law, revenues from congestion charges should be destined exclusively to urban infrastructure for public transportation and non-motorized modes of locomotion (such as walking and cycling), and to finance public subsidies to transit fares. The law went into effect in April 2013. In April 2012, one of the committees of the São Paulo city council approved a bill to introduce congestion pricing within the same area as the existing road space rationing (Portuguese: Rodízio veicular) by the last digit of the license plate, which has been in force 1996. The proposed charge is R$4 (~ US$2) per day and it is expected to reduce traffic by 30% and raise about R$2.5 billion (~ US$1.25 billion) per year, most of which will be destined to the expansion of the São Paulo Metro system and bus corridors. The bill still needs approval by two other committees before going for a final vote at the city council. Since 1995, 11 bills have been presented in the city council to introduce congestion pricing. Opinion surveys have shown that the initiative is highly impopular. A survey by Veja magazine found that 80% of drivers are against congestion pricing, and another survey by Exame magazine found that only 1% of São Paulo's residents support the initiative, while 30% find that extending the metro system is a better solution to reduce traffic congestion. São Paulo's strategic urban development plan "SP 2040", approved in November 2012, proposes the implementation of congestion pricing by 2025, when the density of metro and bus corridors is expected to reach 1.25 km/km2. The Plan also requires ample consultation and even a referendum before beginning implementation. Congestion pricing has also been implemented in urban freeways. Between 2004 and 2005, Santiago de Chile implemented the first 100% non-stop urban toll for a freeway passing through a downtown area, charging by the distance traveled. Congestion pricing has been used since 2007 during rush hours in order to maintain reasonable speeds within the city core. Norwegian road sign 792.30 indicates an automatic toll station. According to the latest template on road signage in automatic toll stations, this sign shall be posted on the toll station. Norway pioneered the implementation of electronic urban tolling in the main corridors of Norway's three major cities: Bergen (1986), Oslo (1990), and Trondheim (1991). In Bergen cars can only enter the central area using a toll road, so that the effect is similar to a congestion charge. Though initially intended only to raise revenues to finance road infrastructure, the urban toll ring at Oslo created an unintended congestion pricing effect, as traffic decreased by around 5%. The Trondheim Toll Scheme also has congestion pricing effects, as charges vary by time of day. The Norwegian authorities pursued authorization to implement congestion charges in cities, and legislation was approved by Parliament in 2001. In October 2011 the Norwegian government announced the introduction of rules allowing congestion charging in cities. The measure is intended to cut greenhouse gas and air pollutant emissions, and relief traffic congestion. As of November 2015[update], Norwegian authorities have implemented urban charging schemes that operates both on the motorways and for access into downtown areas in five additional cities or municipalities: Haugesund, Kristiansand, Namsos, Stavanger, and Tønsberg. The Norwegian electronic toll collection system is called AutoPASS and is part of the joint venture EasyGo. FasTrak HOT lanes at 91 Express Lanes, at Orange County, California. Other recent application of congestion pricing policies in the urban transportation context is to adopt an innovative tolling for a particular limited purpose. The first of this kind of specific schemes allowed users of low or single-occupancy vehicles to use a high-occupancy vehicle lanes (HOV) if they pay a toll. This scheme is known as high-occupancy toll lanes (HOT) lanes, and it has been introduced mainly in the United States and Canada. The first practical implementations was California's private toll 91 Express Lanes, in Orange County in 1995, followed in 1996 by Interstate 15 in San Diego. There has been controversy over this concept, and HOT schemes have been called "Lexus" lanes, as critics see this new pricing scheme as a perk to the rich. According to the Texas A&M Transportation Institute, by 2012 there were in the United States 722 corridor-miles of HOV lanes, 294 corridor-miles of HOT/Express lanes and 163 corridor-miles of HOT/Express lanes under construction. Congestion pricing in the form of variable tolls by time-of-the-day have also been implemented in bridges and tunnels providing access to the central business districts of several major cities. In most cases there was a toll already in existence. Variable tolls by time-of the-day were implemented on the Sydney Harbour Bridge in January 2009. In March 2001, the Port Authority of New York and New Jersey implemented a discount on regular toll fees during off-peak hours for those vehicles paying electronically with an EZ Pass issued in New York State. These discount toll was implemented at several tunnels and bridges connecting New York City and New Jersey, including the George Washington Bridge, Lincoln Tunnel, and Holland Tunnel, and at some other bridges administrated by PANYNJ. Since March 2008, qualified low-emission automobiles with a fuel economy of at least 45 miles per gallon are eligible to receive a Port Authority Green Pass, which allows for a 50% discount during off-peak hours as compared to the regular full toll. In July 2010 congestion tolls were implemented at the San Francisco-Oakland Bay Bridge. The Bay Bridge congestion pricing scheme charges a US$6 toll from 5 a.m. to 10 a.m. and 3 p.m. to 7 p.m., Monday through Friday. During weekends cars pay US$5. The toll remained at the previous toll of US$4 at all other times on weekdays. According to the Bay Area Toll Authority fewer users are driving during the peak hours and more vehicles are crossing the Bay Bridge before and after the 5–10 a.m. period in which the congestion toll goes into effect. The agency also reported that commute delays in the first six months have dropped by an average of 15 percent compared with 2009. When the congestion tolls were proposed, the agency expected the scheme to produce a 20 to 30 percent drop in commute traffic. Both in the academic literature and in practice, the implementation of congestion pricing for urban road travel has raised several concerns, and has been subject of debate and controversy. In a road network, congestion can be considered a specific measure of the time delay in a journey or time lost through traffic jams. Delays can be caused by some combination of traffic density, road capacity, and the delaying effects of other road users and traffic management schemes such as traffic lights, junctions, and street works. This can be measured as the extra journey time needed to traverse a congested route when compared to the same route with no such interference. However, this technical definition of congestion as a measurement of delay can get confused and used interchangeably with traffic density in the public mind. To measure the true effects of any traffic management scheme it is normally necessary to establish a baseline, or "do nothing" case, which estimates the effects on the network without any changes other than normal trends and expected local changes. Notably this was not done for the London Congestion Charging Scheme, which has led to claims that it is not possible to determine the extent of the actual influence of the scheme. Regardless of the scheme's impact, in a retrospective analysis Transport for London (TfL) estimated there would have already been a significant reduction in traffic as a consequence of parking policies and increased congestion due to traffic management and other interventions that had the effect of reducing highway capacity. In 2006, the last year before the zone was expanded, TfL observed that traffic flows were lower than in any recent year, while network traffic speeds were also lower than in any recent year. In 2013, ten years since its implementation, TfL reported that the congestion charging scheme resulted in a 10% reduction in traffic volumes from baseline conditions, and an overall reduction of 11% in vehicle kilometres in London between 2000 and 2012. Despite these gains, traffic speeds have also been getting progressively slower over the past decade, particularly in central London. TfL explains that the historic decline in traffic speeds is most likely due to interventions that have reduced the effective capacity of the road network in order to improve the urban environment, increase road safety and prioritise public transport, pedestrian and cycle traffic, as well as an increase in road works by utilities and general development activity since 2006. TfL concludes that while levels of congestion in central London are close to pre-charging levels, the effectiveness of the congestion charge in reducing traffic volumes means that conditions would be worse without the Congestion Charging scheme. "True social-cost pricing of metropolitan travel has proven to be a theoretical ideal that so far has eluded real-world implementation. The primary obstacle is that except for professors of transportation economics and a cadre of vocal environmentalists, few people are in favor of considerably higher charges for peak-period travel. Middle-class motorists often complain they already pay too much in gasoline taxes and registration fees to drive their cars, and that to pay more during congested periods would add insult to injury. In the United States, few politicians are willing to champion the cause of congestion pricing for fear of reprisal from their constituents. Critics also argue that charging more to drive is elitist policy, pricing the poor off of roads so that the wealthy can move about unencumbered. It is for all these reasons that peak-period pricing remains a pipe dream in the minds of many." The real-world demand functions for urban road travel are more complex than the theoretical functions used in transport economics analysis. Congestion pricing was developed as a first-best solution, based on the assumption that the optimal price of road space equals the marginal cost price if all other goods in the economy are also marginal cost priced. In the real world this is not true, thus, actual implementation of congestion pricing is just a proxy or second-best solution. Based on the economic principles behind congestion pricing, the optimal congestion charge should make up for the difference between the average cost paid by the driver and the marginal cost imposed on other drivers (such as extra delay) and on society as a whole (such as air pollution). The practical challenge of setting optimal link-based tolls is daunting given that neither the demand functions nor the link-specific speed-flow curves can be known precisely. Therefore, transport economists recognize that in practice setting the right price for the congestion charge becomes a trial and error experience. Inequality issue: A main concern is the possibility of undesirable distribution repercussions because of the diversity of road users. The use of the tolled road depends on the user's level of income. Where some cannot afford to pay the congestion charge, then this policy is likely to privilege the middle-class and rich. The users who shift to some less-preferred alternative are also worse off. The less wealthy are the more likely to switch to public transit. Road space rationing is another strategy generally viewed as more equitable than congestion pricing. However, high-income users can always avoid the travel restrictions by owning a second car and users with relatively inelastic demand (such as a worker who needs to transport tools to a job site) are relatively more impacted. There are difficulties in deciding how to allocate the revenues raised. This is a controversial issue among scholars. The revenues can be used to improve public transport (as is the case in London), or to invest in new road infrastructure (as in Oslo). Some academics make the case that revenues should be disposed as a direct transfer payments to former road users. Congestion pricing is not intended to increase public revenues or to become just another tax, however this is precisely one of the main concerns of road users and taxpayers. One alternative, aimed at avoiding inequality and revenue allocation issues, is to implement a rationing of peak period travel through mobility rights or revenue-neutral credit-based congestion pricing. This system would be similar to the existing emissions trading of carbon credit. Metropolitan area or city residents, or the taxpayers, would be issued mobility rights or congestion credits, and would have the option of using these for themselves, or trading or selling them to anyone willing to continue traveling by automobile beyond their personal quota. This trading system would allow direct benefits to be accrued by those users shifting to public transportation or by those reducing their peak-hour travel rather than the government. Experience from the few cities where congestion pricing has been implemented shows that social and political acceptability is key. Public discontent with congestion pricing, or rejection of congestion pricing proposals, is due mainly to the inequality issues, the economic burden on neighboring communities, the effect on retail businesses and the economic activity in general, and the fears that the revenues will become just another tax. Congestion pricing remains highly controversial with the public both before and after implementation. This has in part been resolved through referendums, such as after the seven-month trial period in Stockholm; however this creates a debate as to where the border line for the referendum should go, since it is often the people living outside the urban area who have to pay the tax, while the external benefit is granted to those who live within the area. In Stockholm there was a majority in the referendum within the city border (where the votes counted), but not outside. Some concerns have also been expressed regarding the effects of cordon area congestion pricing on economic activity and land use, as the benefits are usually evaluated from the urban transportation perspective only. However, congestion pricing schemes have been used with the main objective of improving urban quality and to preserve historical heritage in the small cities. The effects of a charge on business have been disputed; reports have shops and businesses being heavily impacted by the cost of the charge, both in terms of lost sales and increased delivery costs in London, while others show that businesses were then supporting the charge six months after implementation. Reports show business activity within the charge zone had been higher in both productivity and profitability and that the charge had a "broadly neutral impact" on the London wide economy, while others claim an average drop in business of 25% following the 2007 extension. Other criticism has been raised concerning the environmental effects on neighborhoods bordering the congestion zone, with critics claiming that congestion pricing would create "parking lots" and add more traffic and pollution to those neighborhoods, and the imposition of a regressive tax on some commuters. Stockholm's trial of congestion pricing, however, showed a reduction in traffic in areas outside the congestion zone. Other opponents argue that the pricing could become a tax on middle- and lower-class residents, since those citizens would be affected the most financially. The installation of cameras for tracking purposes may also raise civil liberties concerns. A study of congestion pricing in Stockholm between 2006–2010 found that in the absence of congestion pricing that Stockholm's "air would have been five to ten percent more polluted between 2006 and 2010, and young children would have suffered 45 percent more asthma attacks". A 2013 study found that after congestion pricing was implemented in Seattle, drivers reported greater satisfaction with the routes covered by congestion pricing and reported lower stress. Several dozen vessels queuing at the Pacific Ocean waiting to enter the Panama Canal. The Panama Canal had a limited capacity determined by operational times and cycles of the existing locks and further constrained by the current trend towards larger (close to Panamax-sized) vessels transiting the canal which take more transit time within the locks and navigational channels, and the need for permanent periodical maintenance works due to the aging canal, which forces periodical shutdowns of this waterway. On the other hand, demand has been growing due to the rapid growth of international trade. Also, many users require a guarantee of certain level of service. Despite the gains which have been made in efficiency, the Panama Canal Authority (ACP) estimates that the canal will reach its maximum sustainable capacity between 2009 and 2012. The long-term solution for the congestion problems was the expansion of the canal through a new third set of locks. Work started in 2007 and the expanded canal enter commercial operation in June 2016. The new locks allow transit of larger, Post-Panamax ships, which have a greater cargo capacity than the current locks are capable of handling. Considering the high operational costs of the vessels (container ships have daily operational costs of approximately US$40,000), the long queues that occur during the high season (sometimes up to a week's delay), and the high value of some of the cargo transported through the canal, the ACP implemented a congestion pricing scheme to allow a better management of the scarce capacity available and to increase the level of service offered to the shipping companies. The scheme gave users two choices: (1) transit by order of arrival on a first-come first-served basis, as the canal historically has operated; or (2) booked service for a fee—a congestion charge. The booked service allowed two options of fees. The Transit Booking System, available online, allowing customers who do not want to wait in queue to pay an additional 15% over the regular tolls, guaranteeing a specific day for transit and crossing the canal in 18 hours or less. ACP sells 24 of these daily slots up to 365 days in advance. The second choice was high priority transit. Since 2006, ACP has available a 25th slot, sold through the Transit Slot Auction to the highest bidder. The main customers of the Transit Booking System are cruise ships, container ships, vehicle carriers, and non-containerized cargo vessels. The highest toll for high priority passage paid through the Transit Slot Auction was US$220,300 charged on a tanker in August 2006, bypassing a 90-ship queue awaiting for the end of maintenance works on the Gatun locks, thus avoiding a seven-day delay. The normal fee would have been just US$13,430. The average regular toll is around US$54,000. Many airports are facing extreme congestion, runway capacity being the scarcest resource. Congestion pricing schemes have been proposed to mitigate this problem, including slot auctions, such as with the Panama Canal, but implementation has been piecemeal. The first scheme was started in 1968 when higher landing fees for peak-hour use by aircraft with 25 seats or less at Newark, Kennedy, and LaGuardia airports in New York City. As a result of the higher charges, general aviation activity during peak periods decreased by 30%. These fees were applied until deregulation of the industry, but higher fees for general aviation were kept to discourage this type of operations at New York's busiest airports. In 1988 a higher landing fee for smaller aircraft at Boston's Logan Airport was adopted; with this measure much of the general aviation abandoned Logan for secondary airports. In both US cases the pricing scheme was challenged in court. In the case of Boston, the judge ruled in favor of general aviation users due to lack of alternative airports. In the case of New York, the judge dismissed the case because "the fee was a justified means of relieving congestion". Congestion pricing has also been implemented for scheduled airline services. The British Airports Authority (BAA) has been a pioneer in implementing congestion pricing for all types of commercial aviation. In 1972 implemented the first peak pricing policy, with surcharges varying depending on the season and time of the day, and by 1976 raised these peak charges. London-Heathrow had seven pricing structures between 1976 and 1984. In this case it was the US carriers that went to international arbitration in 1988 and won their case. In 1991, the Athens Airport charged a 25% higher landing fee for those aircraft arriving between 11:00 and 17:00 during the high tourism season during summer. Hong Kong charges an additional flat fee to the basic weight charge. In 1991–92 peak pricing at London's main airports Heathrow, Gatwick and Stansted was implemented; airlines were charged different landing fees for peak and off-peak operations depending on the weight of aircraft. For example, in the case of a Boeing 757, the peak landing fee was about 2.5 times higher than the off-peak fee in all three airports. For a Boeing 747 the differential was even higher, as the old 747 carries a higher noise charge. Though related to runway congestion, the main objective of these peak charges at the major British airports was to raise revenue for investment. ^ a b Button, Kenneth J. (1993). Transport Economics 2nd Edition. Edward Elgar Publishing Ltd, England. p. 153. ISBN 978-1-85278-523-9. ^ a b Small, Kenneth A.; Verhoef, Erik T. (2007). The Economics of Urban Transportation. Routledge, New York. p. 120. ISBN 978-0-415-28515-5. ^ a b Small, Kenneth A.; José A. Gomez-Ibañez (1998). Road Pricing for Congestion Management: The Transition from Theory to Policy. The University of California Transportation Center, University of California at Berkeley. p. 213. ^ a b Walters, A. A. (1968). The Economics of Road User Charges. World Bank Staff Occasional Papers Number Five, Chapter VII, Washington, D.C. pp. 191–217. ISBN 978-0-8018-0653-7. ^ a b Holtz-Eakin, Douglas (2003-05-06). "Congestion Pricing for Highways (Testimony before the Joint Economic Committee, U.S. Congress)". Congressional Budget Office. Archived from the original on 2008-02-14. Retrieved 2008-02-26. ^ Lindsey, Robin (May 2006). "Do Economists Reach a Conclusion on Road Pricing? The Intellectual History of an Idea" (PDF). Econ Journal Watch. 3 (2): 292–379. Retrieved 2008-12-09. ^ Sperling, Daniel; Deborah Gordon (2009). Two billion cars: driving toward sustainability. Oxford University Press, New York. pp. 42–43. ISBN 978-0-19-537664-7. ^ Thomas L. Friedman (2008). Hot, Flat, and Crowded. Farrar, Straus and Giroux, New York. pp. 193–194. ISBN 978-0-374-16685-4. ^ Tim Harford (2007). The Undercover Economist. Random House Trade Paperbacks, New York. pp. 74–92. ISBN 978-0-345-49401-6. See chapters 4: Crosstown Traffic. ^ Cervero, Robert (1998). The Transit Metropolis. Island Press, Washington, D.C. ISBN 978-1-55963-591-2. ^ The World Bank (1996). Sustainable Transport: Priorities for Policy Reform. The World Bank, Washington, D.C. pp. 48–49. ISBN 978-0-8213-3598-7. ^ Henderson, Tristan; Jon Crowcroft & Saleem Bhatti (2001). "Congestion Pricing – Paying Your Way in Communication Networks" (PDF). IEEE INTERNET COMPUTING, September•October 2001. Archived from the original (PDF) on 2008-06-27. Retrieved 2008-03-01. ^ Button, Kenneth J. (1993). "op. cit": 154–156. ^ a b Small, Kenneth A.; Verhoef, Erik T. (2007). "op. cit": 125–127. ^ Sheldon G. Strickland; Wayne Ber (Winter 1995). "Congestion Control and Demand Management". Public Roads Magazine. 58 (3). Archived from the original on 2008-03-17. Retrieved 2008-02-28. ^ Button, Kenneth J. (1993). "op. cit": 153. ^ Small, Kenneth A.; Verhoef, Erik T. (2007). "op. cit": 120. ^ "Nobelist William S. Vickrey: Practical Economic Solutions to Urban Problems". Columbia University. 1996-10-08. Retrieved 2009-03-27. ^ a b Daniel Gross (2007-02-17). "What's the Toll? It Depends on the Time of Day". The New York Times. Retrieved 2008-07-15. ^ Victoria Transport Policy Institute (1992). "Principles of Efficient Congestion Pricing – William Vickrey". Victoria Transport Policy Institute. Retrieved 2009-03-10. ^ Smeed, R.J. (1964). Road pricing: the economic and technical possibilities. HMSO. ^ Ben Webster; Michael Evans (2005-06-06). "Radical dreams for the future of transport haunted by past failures". The Times. London: Times Newspapers. Retrieved 2008-02-28. ^ Small, Kenneth A.; José A. Gomez-Ibañez (1998). Road Pricing for Congestion Management: The Transition from Theory to Policy. The University of California Transportation Center, University of California at Berkeley. p. 227. ^ Small, Kenneth A.; José A. Gomez-Ibañez (1998). "op. cit": 214. ^ "Road Pricing: Congestion Pricing, Value Pricing, Toll Roads and HOT Lanes". TDM Encyclopedia. Victoria Transport Policy Institute. 2007-09-04. Retrieved 2008-07-15. ^ Small, Kenneth A.; Verhoef, Erik T. (2007). The Economics of Urban Transportation. Routledge, England. p. 148. ISBN 978-0-415-28515-5. ^ Chin Kian Keong (2002-10-23). "Road pricing Singapore's experience" (PDF). Third Seminar of the IMPRINT-EUROPE Thematic Network: "Implementing Reform on Transport Pricing: Constraints and solutions: learning from best practice". Archived from the original (PDF) on June 27, 2008. Retrieved 2008-07-15. ^ "Electronic Road Pricing". Land Transport Authority (Singapore). Website official. Archived from the original on 2008-04-10. Retrieved 2008-04-16. ^ "The history of Limited Access Zones in Rome". PRoGR€SS Project. Archived from the original on 2008-03-09. Retrieved 2013-04-13. ^ Swedish Road Administration (2007-08-21). "Congestion tax in Stockholm". Archived from the original on 2007-03-02. Retrieved 2008-07-15. ^ Ken Belson (2008-01-27). "Toll Discounts for Going Green". The New York Times. Retrieved 2008-01-27. ^ BBC News (2008-03-02). "Milan introduces traffic charge". Retrieved 2008-01-17. ^ Richard Owen (2008-01-03). "Congestion fee leaves Milan in a jam". London: Times Online. Retrieved 2008-04-16. ^ Edoardo Croci (2008-12-31). "Ecopass. Prorogato fino al 31 dicembre 2009. Nei primi mesi dell'anno prevista la consultazione dei cittadini" (in Italian). Comune di Milano. Retrieved 2009-02-14. The complete pricing scheme is presented in this article. ^ "Official Ecopass page" (in Italian). Comune Milano. Retrieved 2011-11-02. ^ a b "Area C è partita: calate del 40% le auto in centro dopo l'entrata in vigore del pedaggio" [Area C takes off: auto traffic decreased 40% in the center after the toll goes into force]. Corriere della Sera Milano (in Italian). 2012-01-16. Retrieved 2012-01-16. ^ Swedish Transport Agency. "Congestion Tax Gothenburg" (PDF). Transport Styrelsen. Archived from the original (PDF) on 2013-12-13. Retrieved 2013-12-10. ^ Environmental Defense Fund (2007-12-05). "Congestion Pricing: A smart solution for reducing traffic in urban centers and busy corridors". Archived from the original on 2008-04-11. Retrieved 2008-04-16. ^ Zubin Jelveh (2007-05-08). "The Stockholm Solution". CONDÉ NAST PORTFOLIO. Retrieved 2008-07-15. ^ Transport for London. "Congestion charging home page". Archived from the original on 2008-04-03. Retrieved 2008-04-06. ^ Swedish Road Administration. "Congestion tax in Stockholm home page" (in Swedish). Archived from the original on 2007-03-02. Retrieved 2008-07-15. ^ Land Transport Authority. "Electronic Road Pricing, LTA home page". Archived from the original on 2008-04-04. Retrieved 2008-04-06. ^ Ken Belson (2008-03-16). "Importing a Decongestant for Midtown Streets". New York Times. Retrieved 2008-04-06. ^ "Predicting Where The Traffic Will Flow". PLANETIZEN. Retrieved 2008-04-06. ^ "IBM and Singapore's Land Transport Authority Pilot Innovative Traffic Prediction Tool". IBM Press release. 2007-08-01. Retrieved 2008-07-15. ^ Channel NewsAsia (2010-06-10). "Satellite navigation ERP and electric cars possible on future road system". CNA. Retrieved 2012-01-02. ^ Transport for London. "CO2 charging". Archived from the original on April 3, 2008. Retrieved 2008-04-06. ^ "Congestion charging home page: CO2 charging table". Transport for London. Archived from the original on April 3, 2008. Retrieved 2008-04-06. ^ "When work begins for Mayor Johnson". BBC News. 2008-05-03. Retrieved 2008-05-06. ^ "Bank holiday Boris promises to work 'night and day' as father eyes his Commons seat". Daily Mail. 2008-05-06. Retrieved 2008-05-06. ^ a b "Mayor quashes £25 C-charge hike". BBC News. 2008-07-08. Retrieved 2008-08-16. ^ "Warning over pollution c-charge". BBC News. 2007-10-18. Retrieved 2008-08-16. According to a report commissioned by Land Rover, the emission-related scheme would increase traffic delays and air pollution. ^ Dan Milmo (2008-07-02). "Transport: London Mayor unveils congestion charge rethink". The Guardian. Retrieved 2008-08-16. ^ "Consultation results". Transport for London. Retrieved 2010-12-06. ^ "Congestion charge greener vehicles rule change planned". BBC News. 2012-12-11. Retrieved 2012-11-20. ^ Tom McGhie (2012-12-01). "Only electric cars to beat London's congestion charge from next year if emission proposals are accepted". This is Money. Retrieved 2012-12-09. ^ "London to introduce new Ulta Low Emission Discount for Congestion Charge scheme; countering dieselization". Green Car Congress. 2013-04-24. Retrieved 2013-04-24. ^ "London tightens up congestion charge in attempt to drive out diesel". The Guardian. 2013-04-24. Retrieved 2013-04-24. ^ "New green discount for the congestion charge comes in". BBC News. 2013-07-01. Retrieved 2013-07-02. ^ Lilly, Chris (2016-06-24). "Congestion charge sunset period ends today". Next Green Car. Retrieved 2016-06-29. ^ Faye Sunderland (2014-01-07). "London Congestion Charge to rise by 15%". The Green Car Website UK. Retrieved 2014-01-12. ^ Ross Lydall (2013-02-15). "Congestion Charge 'has cost drivers £2.6bn in decade but failed to cut traffic jams'". London Evening Standard. Retrieved 2015-02-15. ^ Press Association (2014-05-28). "London congestion charge to rise". The Guardian. Retrieved 2015-02-15. ^ Gwyn Topham (2014-01-06). "London congestion charge expected to rise by at least 15%". The Guardian. Retrieved 2015-02-15. ^ Mason, Rowena (2017-02-17). "London to introduce £10 vehicle pollution charge, says Sadiq Khan". The Guardian. Retrieved 2017-02-24. ^ Saarinen, Martin (2017-02-17). "London introduces new £10 'T-charge' to cut vehicle pollution". Auto Express. Retrieved 2017-02-24. ^ Kimiko de Reytas-Tamura (2017-02-17). "A Push for Diesel Leaves London Gasping Amid Record Pollution". The New York Times. Retrieved 2017-02-24. ^ "London's new pollution charge begins". 2019-04-08. Retrieved 2019-04-08. ^ "Pisapia lancia l'operazione Area C l'obiettivo: -20 per cento di traffico". Corriere della Sera Milano (in Italian). 2011-12-18. Retrieved 2012-01-02. ^ a b Rosario Mastrosimone (2011-12-27). "Congestion charge Milano: Area C, tariffe, divieti, esenti" (in Italian). Sostenibile. Retrieved 2012-01-02. ^ Comune di Milano (2013-03-17). "Area C. Istituita la congestion charge definitiva" [Area C. The congestion charge was made permanent] (in Italian). Comune di Milano. Retrieved 2013-10-19. ^ a b c d Trafikverket (Swedish Transport Administration) and Transportstyrelsen (Swedish Transport Agency) (2015). "On 1 January 2016, congestion taxes in Stockholm will be raised and congestion tax will be levied on Essingeleden" (PDF). Transportstyrelsen. Retrieved 2016-06-29. ^ a b "Höjd och ny trängselavgift ger effekt" [Increase and new congestion charge gives effect]. Svenska Dagbladet (in Swedish). 2016-01-12. Retrieved 2016-06-24. ^ "Local welcome for congestion charge". BBC. 2002-10-01. Retrieved 2007-04-27. ^ a b European Local Transport Information Service (ELTIS) (2007). "Inner city access restriction for substainable mobility for inhabitants and tourists (Znojmo, Czech Republic)". Archived from the original on 2009-09-07. Retrieved 2008-03-01. ^ Helen Pickles (2003-04-22). "Riga: Weekend to remember". Telegraph.co.uk. Retrieved 2013-04-13. ^ Sewell Chan (2005-11-11). "Achieving Green Cities Through Road Pricing". Environmental and Urban Economics. Retrieved 2008-07-15. ^ a b "Valletta traffic congestion considerably reduced". MaltaMedia News. 2007-05-06. Retrieved 2008-07-15. ^ "Country's First Congestion Charge is a Year Old Tomorrow". Durham County Council. 2003-09-30. Archived from the original on October 7, 2007. Retrieved 2008-07-15. ^ European Local Transport Information Service (ELTIS). "Controlled Vehicle Access, Valleta, Malta". Archived from the original on 2009-09-07. Retrieved 2008-04-05. ^ "Edinburgh to decide on road tolls". BBC News. British Broadcasting Corporation. 2005-02-07. Retrieved 2008-07-15. ^ "Edinburgh rejects congestion plan". BBC News. British Broadcasting Corporation. 2005-02-22. Retrieved 2008-07-15. ^ Cramb, Auslan (2005-02-08). "Edinburgh votes on £2 road toll". The Daily Telegraph. Telegraph News and Media Limited. Retrieved 2007-12-02. ^ "Road pricing proposals rejected". BBC News. 2008-03-05. Retrieved 2008-04-08. ^ Danny Hakim; Nicholas Confessore (2007-07-17). "Albany Rebuffs City Traffic Plan". The New York Times. Retrieved 2008-07-15. ^ Transportation Alternatives. "Congestion Pricing". Archived from the original on 2008-03-05. Retrieved 2008-03-01. ^ Nicholas Confessore (2008-04-07). "Congestion Pricing Plan Is Dead, Assembly Speaker Says". The New York Times. Archived from the original on 2008-04-11. Retrieved 2008-04-07. ^ Henry Goldman (2008-04-01). "New York Council Approves Manhattan Traffic Fees". Bloomberg.com. Retrieved 2008-04-02. ^ Nicholas Confessore (2008-04-08). "$8 Traffic Fee for Manhattan Gets Nowhere". The New York Times. Retrieved 2008-04-08. ^ Salter, Alan (2007-05-05). "C-charge details revealed". Manchester Evening News. M.E.N. Media Ltd. Archived from the original on 2008-07-08. Retrieved 2008-07-15. ^ "Manchester makes move towards congestion charge". The Guardian. Guardian News and Media Limited. 2007-07-27. Retrieved 2008-07-15. ^ "Traffic Congestion charging: FAQs". BBC Manchester. Retrieved 2008-07-15. ^ David Ottewell (2008-06-09). "Kelly paves way for c-charge". Manchester Evening News. Retrieved 2008-06-27. ^ "Council to vote on road pricing". BBC News. British Broadcasting Corporation. 2008-01-09. Retrieved 2008-04-03. ^ "Greater Manchester TIF package unlocks up to £3 billion of investment". GMPTE. Greater Manchester Public Transport Entity. 2008-09-06. Archived from the original on 2008-11-16. Retrieved 2008-07-07. ^ "Voters reject congestion charge". BBC. 2008-12-12. Retrieved 2008-12-12. ^ "Urban Partnerships". U.S. Department of Transportation. Archived from the original on June 28, 2008. Retrieved 2008-06-20. ^ "San Francisco Urban Partnership Agreement". U.S. Department of Transportation. Retrieved 2008-06-20. ^ "Seattle (Lake Washington) Urban Partnership Agreement". U.S. Department of Transportation. Archived from the original on August 7, 2008. Retrieved 2008-06-20. ^ "Miami Urban Partnership Agreement". U.S. Department of Transportation. Archived from the original on May 3, 2008. Retrieved 2008-06-20. ^ "Minneapolis Urban Partnership Agreement". U.S. Department of Transportation. Archived from the original on August 7, 2008. Retrieved 2008-06-20. ^ Jennifer Lee (2008-04-29). "Chicago Gets New York's Congestion Money". The New York Times. Retrieved 2008-06-20. ^ "Mobility, Access and Pricing Study". San Francisco County Transportation Authority. Archived from the original on 2009-06-14. Retrieved 2010-06-21. ^ Rachael Gordon (2007-09-19). "S.F. studying congestion pricing to ease traffic, promote transit". San Francisco Chronicle. Retrieved 2008-07-15. ^ Malia Wollan (2009-01-04). "San Francisco Studies Fees to Ease Traffic". The New York Times. Retrieved 2009-02-22. ^ Rachel Gordon (2010-11-11). "S.F. may hit drivers with variety of tolls". San Francisco Chronicle. Retrieved 2010-12-05. ^ Heather Ishimaru (2010-11-10). "SF considers downtown congestion pricing". ABC7 News San Francisco. Retrieved 2010-12-05. ^ Santora, Marc (August 13, 2017). "Cuomo Calls Manhattan Traffic Plan an Idea 'Whose Time Has Come'". The New York Times. ISSN 0362-4331. ^ Goodman, J. David (August 21, 2017). "Mayor de Blasio Says He 'Does Not Believe' in Congestion Pricing". The New York Times. ISSN 0362-4331. Retrieved August 23, 2017. ^ Hu, Winnie (November 28, 2017). "New York's Tilt Toward Congestion Pricing Was Years in the Making". The New York Times. ISSN 0362-4331. Retrieved November 30, 2017. ^ Dwyer, Jim; Hu, Winnie (2018-01-19). "Driving a Car in Manhattan Could Cost $11.52 Under Congestion Plan". The New York Times. ^ Griswold (March 31, 2019). "New York's congestion pricing will make it more expensive to drive in Manhattan". Quartz. Retrieved March 1, 2019. ^ Plitt, Amy (March 1, 2019). "NYC poised to implement the country's first congestion pricing program". 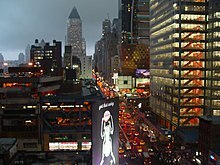 Curbed NY. Retrieved March 1, 2019. ^ "Congestion pricing passes without key details". am New York. March 1, 2019. Retrieved March 1, 2019. ^ a b "Beijing mulls congestion charge". Xinhua News Agency. China Daily. 2015-12-03. Retrieved 2015-12-07. ^ "Beijing 'plans congestion charge' to ease traffic woes". BBC News. 2011-09-02. Retrieved 2011-09-07. ^ China Daily (2010-12-21). "Time to fix traffic in Beijing". Xinhuanet. Archived from the original on 2010-12-24. Retrieved 2011-09-07. ^ a b "Will Congestion Pricing Relieve Traffic Jams?". Beijing Review. 2010-05-31. Retrieved 2011-09-07. ^ Natasha Li (2015-12-04). "Beijing Plans to Implement "Congestion Charge" Next Year". Gasgoo.com. Retrieved 2015-12-07. ^ a b "Beijing Seeks to Legislate Car Quotas as It Mulls Congestion Fee". Bloomberg News. 2016-05-25. Retrieved 2016-05-28. ^ "The great crawl". The Economist. 2016-06-18. Retrieved 2016-06-22. From the print edition. ^ Andrew Downie (2008-04-21). "The World's Worst Traffic Jams". Time. Retrieved 2013-06-27. ^ Marta Salomon; Iuri Dantas; Andréa Jubé Vianna (2012-01-09). "Lei federal autoriza criação de pedágio urbano por prefeituras" [Federal law authorizes the creation of congestion pricing by local governments]. O Estado de S. Paulo (in Portuguese). Retrieved 2013-06-26. ^ Agência Estado (2012-01-04). "Dilma aprova lei que prevê pedágio urbano" [Dilma approves law that allows congestion pricing]. R7 Noticias (in Portuguese). Archived from the original on 2013-05-11. Retrieved 2013-06-26. ^ Presidência da República (2012-01-03). "Lei Nº 12.587, de 3 de Janeiro de 2012" [Law N. 12.587 of January 3rd, 2012] (in Portuguese). Presidência da República, Casa Civil. Retrieved 2013-06-26. See article 23. ^ Roney Domingos (2012-04-25). "Projeto que cria pedágio urbano passa em comissão na Câmara de SP" [Bill to create congestion pricing passed in commission of the São Paulo city council]. O Globo (in Portuguese). Retrieved 2013-06-27. ^ "Pedágio urbano de São Paulo pode custar até R$ 88 por mês" [São Paulo's congestion pricing could cost up to R$88 per month]. Terra (in Portuguese). 2012-04-26. Retrieved 2013-06-27. ^ Claudia Jordão e Maria Paola de Salvo (2012-06-20). "Perdendo 30 bilhões de reais por ano por congestionamentos de trânsito, SP mira o exemplo do pedágio urbano de Londres" [Lossing 30 billion reais per year due to traffic congestion, São Paulo looks at the example of London congestion charges]. Veja São Paulo (in Portuguese). Archived from the original on 2013-12-19. Retrieved 2013-06-27. ^ Amanda Previdelli (2012-06-11). "Paulistano não quer pedágio urbano, segundo Datafolha" [São Paulo residents do not want congestion pricing according to Datafolha]. Exame (in Portuguese). Retrieved 2013-06-27. ^ "Pedágio urbano e incineração de lixo estão entre as propostas da SP 2040" [Congestion pricing and waste incineration are among the proposals of SP 2040]. Folha de S.Paulo (in Portuguese). 2012-11-13. Retrieved 2013-06-27. ^ UK Commission on Integrated Transport. "Road Charging Scheme: South America – Chile, Santiago de Chile". Archived from the original on April 21, 2008. Retrieved 2008-07-04. ^ Costanera Norte Freeway. "Costanera Norte Freeway" (in Spanish). ^ "Costanera Norte Tarifas 2010" (PDF) (in Spanish). Sociedad Concesionaria Costanera Norte. Archived from the original (PDF) on February 15, 2010. Retrieved 2010-02-27. Three different tolls are charged based on pre-set average operating speeds: basic non-peak hour, basic rush hour, and fixed congestion toll. ^ "Autopistas urbanas proponen subir tarifas y el MOP elabora plan para auditar alzas" (in Spanish). ODECU. 2009-07-15. Archived from the original on 2011-07-07. Retrieved 2010-02-27. ^ Ieromanachou, Potter and Warren (September 2006). "Norway's urban toll rings: evolving towards congestion charging?". Transport Policy. 13 (5): 367–378. doi:10.1016/j.tranpol.2006.01.003. ^ Wærsted, Kristian. "Urban Tolling in Norway" (PDF). p. 5. Archived from the original (PDF) on 2011-08-07. ^ Sadler Consultants Ltd. (2015). "Urban Access Regulations: Norway Road Charging". CLARS (Charging, Low Emission Zones, other Access Regulation Schemes). Retrieved 2015-11-17. ^ Small, Kenneth A.; José A. Gomez-Ibañez (1998). Road Pricing for Congestion Management: The Transition from Theory to Policy. The University of California Transportation Center, University of California at Berkeley. pp. 226–232. ^ Bob Hugman (2007-04-08). "Not Such a HOT Idea: 'Lexus Lanes' Could Ruin Virginia's Highly Successful HOV System". The Washington Post. Retrieved 2008-07-15. ^ Peter Samuel (2001-01-11). "Peak/Off-Peak Tolls:Whitman whittles down PANYNJ tolls". TOLLROADSnews. Archived from the original on 2009-03-02. Retrieved 2009-03-10. ^ Ronald Smothers (2001-03-27). "Grumbling, but Still Moving, Under New Rush-Hour Tolls". New York Times. Retrieved 2009-03-10. ^ "New Toll Rates – Effective, 3 AM, March 2, 2008: Frequently Asked Questions (FAQS)". Port Authority of New York and New Jersey. Archived from the original on 2009-03-01. Retrieved 2009-03-10. ^ "Peak hour toll begins on Harbour Bridge". Yahoo!7 News (Australia). 2009-01-27. Archived from the original on 2009-10-05. Retrieved 2009-03-10. ^ Michael Daley (2009-02-05). "Motorists Embrace Cashless Tolling on Sydney Harbour Bridge" (PDF). NSW Minister for Roads. Retrieved 2009-03-10. ^ "Harbour congestion tax 'will anger some'". ABC News (Australia). 2009-01-22. Retrieved 2009-03-10. ^ Michael Cabanatuan (2010-05-13). "Reminder: Bridge tolls go up July 1". The San Francisco Chronicle. Retrieved 2011-01-21. ^ Michael Cabanatuan (2011-01-12). "Conflicting findings on Bay Bridge congestion toll". The San Francisco Chronicle. Retrieved 2011-01-21. ^ Department for Transport and Hedges, A (2001-11-11). "Perceptions of congestion: report on qualitative research findings". Department for Transport. Archived from the original on 2009-09-09. Retrieved 2013-04-12. ^ "An independent assessment of the central London congestion charging scheme". London Councils. 2004-12-13. Archived from the original on September 29, 2010. The CCS is expected to compound these effects but it will be impossible to determine the extent to which it will have done so in the absence of a 'do minimum' comparison. ^ Reg Evans (2007-06-29). "Central London Congestion Charging Scheme: ex-post evaluation of the quantified impacts of the original scheme" (PDF). Transport for London. Archived from the original (PDF) on 2013-05-31. Retrieved 2013-04-12. ^ Transport for London (TfL) (January 2014). "Public and stakeholder consultation on a Variation Order to modify the Congestion Charging scheme Impact Assessment" (PDF). TfL. Retrieved 15 February 2015. See pp. 12: Traffic volume, speed and congestion. ^ Cervero, Robert (1998). The Transit Metropolis. Island Press, Washington, D.C. pp. 67–68. ISBN 978-1-55963-591-2. "Setting the prices right"
^ Verhoef E, Nijkamp P, Rietveld P (1997). "Tradeable permits: their potential in the regulation of road transport externalities". Environment and Planning B: Planning and Design 24(4) 527–548. Retrieved 2008-04-11. ^ José M. Viegas (2001). "Making urban road pricing acceptable and effective: searching for quality and equity in urban mobility". Transport Policy. 8 (4): 289–294. doi:10.1016/S0967-070X(01)00024-5. Archived from the original on 2009-09-06. Retrieved 2008-04-11. ^ Kara M. Kockelman; Sukumar Kalmanje (2005). "Credit-based congestion pricing: a policy proposal and the public's response". Transportation Research Part A: Policy and Practice. 39 (7–9): 671–690. doi:10.1016/j.tra.2005.02.014. Archived from the original on 2009-09-06. Retrieved 2008-04-11. ^ "Stockholmsförsöket". Stockholmsförsöket. Archived from the original on 2007-07-15. Retrieved 2008-07-15. ^ "Trängselskatt – Resultat av folkomröstningar" (in Swedish). Kommunförbundet Stockholms län. Archived from the original on 2008-06-08. Retrieved 2008-07-15. ^ Elena Safirova; et al. (September 2006). "Congestion Pricing: Long-Term Economic and Land-Use Effects" (PDF). Resources for the Future. RFF DP 06-37. Archived from the original (PDF) on 2008-07-19. Retrieved 2008-07-15. ^ European Local Transport Information Service (ELTIS) (2007). "Controlled Vehicle Access, Valleta, Malta". Archived from the original on 2009-09-07. Retrieved 2008-03-01. ^ Muspratt, Caroline (2004-04-21). "Congestion charge cost £300m, say Oxford St traders". Daily Telegraph. Telegraph Media Group Ltd. Retrieved 2008-07-15. ^ Clark, Andrew (2003-08-13). "Business backs congestion charge". The Guardian. Guardian News and Media. Retrieved 2008-07-15. ^ "Impacts monitoring – Fourth Annual Report" (PDF). Transport for London. June 2006. Archived from the original (PDF) on 2008-02-28. Retrieved 2008-02-11. ^ "Traders rally against charge zone". BBC News. British Broadcasting Corporation. 2007-05-21. Retrieved 2008-07-15. ^ Schuster, Karla; James T. Madore (2007-06-12). "Silver hits brakes over city traffic plan". Newsday. Archived from the original on September 7, 2009. Retrieved 2007-06-12. Note: access to this source in no longer available for free. ^ Nissan, Rita (2007-06-13). "Assembly Speaker Silver Not Sold on Congestion Pricing Plan". NY1. Archived from the original on 2008-04-12. Retrieved 2008-07-15. ^ Hakim, Danny (2007-06-12). "Silver Challenges Health Benefits Promised in Manhattan Toll Plan". The New York Times. Retrieved 2008-07-15. ^ Söderholm, Gunnar. "Facts about the Evaluation of the Stockholm Trial" (PDF). Stockholmsförsöket. Archived from the original (PDF) on 2012-02-28. ^ Dobnik, Verena (2007-06-12). "NYC Lawmakers Hold Hearing on 'Congestion Pricing' Traffic Plan". Brooklyn Daily Eagle. Archived from the original on 2008-09-26. Retrieved 2015-10-18. ^ Confessore, Nicholas (2007-06-09). "In Legislators' Scrutiny, Traffic Proposal Faces Hard Questioning". The New York Times. Retrieved 2008-07-15. ^ Hakim, Danny; Ray Rivera (2007-06-08). "City Traffic Pricing Wins U.S. and Spitzer's Favor". The New York Times. Retrieved 2008-07-15. ^ "Driving Fee Rolls Back Asthma Attacks in Stockholm". Inside Science. 2017-02-02. Retrieved 2017-02-09. ^ Simeonova, Emilia; Currie, Janet; Nilsson, Peter; Walker, Reed (March 2018). "Congestion Pricing, Air Pollution and Children's Health". NBER Working Paper No. 24410. doi:10.3386/w24410. ^ Frakt, Austin (2019-01-21). "Stuck and Stressed: The Health Costs of Traffic". The New York Times. ISSN 0362-4331. Retrieved 2019-01-21. ^ Peirce, Sean; Puckett, Sean; Petrella, Margaret; Minnice, Paul; Lappin, Jane (2013). "Effects of Full-Facility Variable Tolling on Traveler Behavior: Evidence from a Panel Study of the Sr-520 Corridor in Seattle, Washington". Transportation Research Record: Journal of the Transportation Research Board. 2345: 74–82. doi:10.3141/2345-10. ^ The Associated Press (2016-06-26). "Panama Canal Opens $5B Locks, Bullish Despite Shipping Woes". The New York Times. Retrieved 2016-06-26. ^ La Prensa (2006-05-09). "Hasta 150 mil dólares por reservar en el Canal" (in Spanish). Archived from the original on 2009-09-07. ^ Panama Canal Authority. "ACP Expansion Proposal" (PDF). p. 36. ^ Wilfredo Jordán Serrano (2007-04-24). "Récord en pago de peajes y reserva" (in Spanish). La Prensa. Retrieved 2014-04-01. ^ La Prensa. Sección Economía & Negocios. (2006-08-25). "Cupo de subasta del Canal alcanza récord" (in Spanish). Archived from the original on 2009-08-03. ^ Doganis, R. (1992). The Airport Business. Routledge, London, UK. p. 40. ISBN 978-0-415-08117-7. ^ United States General Accounting Office. "Reducing Congestion: Congestion Pricing Has Promise for Improving Use of Transportation Infrastructure" (PDF). p. 12. ^ a b Schank, Joshua. "Solving airside airport congestion:Why peak runway pricing is not working" (PDF). p. 420. Archived from the original (PDF) on 2008-06-27. ^ Doganis, R. (1992). The Airport Business. Routledge, London, UK. p. 66. ISBN 978-0-415-08117-7. Button, Kenneth J. (1993). Transport Economics 2nd Edition. Edward Elgar Publishing Ltd, Cheltenham, UK. ISBN 978-1-85278-523-9. Doganis, R. (1992). The Airport Business. Routledge, London. ISBN 978-0-415-08117-7. McDonald, J.F. ; d'Ouville, Edmond L.; Nan Liu, Louie (1999). Economics of Urban Highway Congestion and Pricing (Transportation Research, Economics and Policy Volume 9). Springer, New York. ISBN 978-0-7923-8631-5.
International Transport Forum, Organisation for Economic Co-operation and Development (2010). ITF Round Tables Implementing Congestion Charges. OECD Publishing, Paris. ISBN 978-92-821-0284-8. Kockelman, Kara M.; Kalmanje, Sukumar (2005). "Credit-Based Congestion Pricing: A Policy Proposal and the Public's Response". Transportation Research. 39A (7–9): 671–690. doi:10.1016/j.tra.2005.02.014. Peterson, Sarah Jo; MacCleery, Rachel (2013). When the Road Price Is Right: Land Use, Tolls, and Congestion Pricing. Urban Land Institute. ISBN 978-0-87420-262-5. Smeed, R.J. (1964). Road pricing: the economic and technical possibilities. HMSO. Tsekeris, Theodore; Voß, Stefan (2009). "Design and evaluation of road pricing: State-of-the-art and methodological advances". Netnomics. 10: 5–52. doi:10.1007/s11066-008-9024-z. Walters, A. A. (1968). The Economics of Road User Charges. World Bank Staff Occasional Papers Number Five, Washington, D.C. ISBN 978-0-8018-0653-7. FHWA Congestion Pricing Web Site – FHWA.